Most women are familiar with night sweats and hot flashes as major concerns of menopause. However, as Marla Ahlgrimm explains, there are other effects caused by falling hormone levels. Today, the women’s healthcare expert answers questions regarding menopausal hair loss. Q: How many women lose their hair during menopause? Marla Ahlgrimm: It’s estimated that half of all women experience at least some hair loss during this time. Many more report thinning or even bald spots. Female pattern baldness typically begins just after the onset of menopause as estrogen levels decrease suddenly and dramatically. 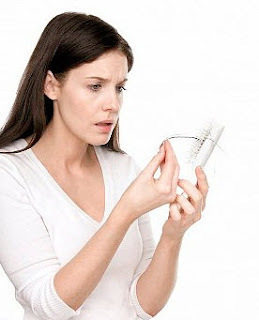 Q: What causes premenopausal hair loss? Marla Ahlgrimm: Before she enters menopause, a woman produces high levels of estrogen. Estrogen along with progesterone serve as protective, balancing hormones to testosterone – a hormone that women also produce. After menopause, estrogen levels fall allowing testosterone to be converted to dihydrotestosterone or DHT. DHT is the cause of female hair loss when testosterone combines with an enzyme known as 5 alpha reductase found in the hair follicle. Q: What are the major concerns typically associated with female hair loss? Marla Ahlgrimm: Although hair loss does not specifically affect a woman’s health per se, it can have a major impact on her emotionally. A woman may feel less feminine and may even become anxious or depressed. And from a practical standpoint, hair loss makes daily grooming more challenging as well. Q: Do women ever go completely bald? Marla Ahlgrimm: Women most often experience diffuse hair loss. This means that while the hair may get quite thin in places, most won’t have the typical balding that many men experience. Q: Is menopause-related hair loss preventable? Marla Ahlgrimm: While no one can 100% guarantee that a woman will not lose some hair during menopause, certain phytoestrogens may help reduce female hair loss. Prescription medications can also be prescribed to help decrease hair loss.